East of Lake Ilinalta, along the road between Helgen and Riverwood. 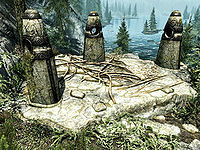 The Guardian Stones is a location which marks three Standing Stones located directly outside of Helgen and Riverwood. They are likely the first standing stones you will encounter, since they are on the path taken while being escorted by Ralof or Hadvar to Riverwood. The stones are The Mage Stone, The Thief Stone, and The Warrior Stone. If selected, they allow you to specialize in magic, stealth or combat skills respectively, by gaining 20% more experience in those skills. Archery is considered a stealth skill in this context. The Mage Stone: Those under the sign of The Mage will learn all magic skills 20% faster. The Thief Stone: Those under the sign of The Thief will learn all stealth skills 20% faster. The Warrior Stone: Those under the sign of The Warrior will learn all combat skills 20% faster. Archery benefits from the Thief Stone's bonus, though it is otherwise considered a combat skill (in internal game data, for the Oghma Infinium and for the Bards College sidequests). This issue has been addressed by version 1.2 of the Unofficial Skyrim Patch; the Warrior Stone's bonus is now assigned to the skill. Using the Aetherial CrownDG makes it possible to maximize the benefits of The Guardian Stones by using it with The Lover Stone. There is an unmarked shrine of Talos to the southwest, surrounded by four dead worshippers. Below the shrine can be found a dead Thalmor soldier, with a note regarding his motives. Three leveled bandits have established a camp directly south of the Guardian Stones, just south of the road that runs along the south shore of Lake Ilinalta (map). Their belongings include a satchel containing random alchemical ingredients, a treasure map, and a copy of the One-handed skill book Night Falls on Sentinel. One clay depositHF can be found just northeast of here, on the opposite side of the lake. This page was last modified on 2 February 2019, at 16:20.